Canek is one of the most charismatic wrestlers Mexico has ever had, one of the biggest lucha box-office draws ever and also a well-known wrestler in Japan, as he'd often tour for Antonio Inoki's New Japan Pro Wrestling during the 80s. Canek, who was an impressive athlete during all his life and a former bodybuilder and amateur wrestler, made his professional debut as El Universitario at age 18. The history goes like this: El Matematico no showed a main-event at the Arena Jardín, so the promoter (a part time wrestler called Black Bat II) asked the young man him to sub Matematico. So that day, "Universitario" teamed with El Angel Azul (Blue Angel) to take on El Profeta and El Chilango García. Several months after that fight, his first partner, Angel Azul, sold him one of his outfits and then El Príncipe Azul (Blue Prince) was born. Under that name he was quite successful, as he took the mask and then the hair of Ultratumba, and also the hair of El Noruego, plus that same year 1972 he was prized with the best wrestler of Villahermosa, Tabasco award. It should be noted that the wrestlers that first trained him were Indio Azteca, Maciste, El Remington I and El Chacal. He later decided to get a new name, so he came up with the name Canek, based on the name of the Mayan warrior Jacinto Canek. Canek's debut match also happened to be during the 1st card ever at a new building that later would become one of the most important Mexican arenas during the 80s: El Toreo De Cuatro Caminos. That 24th of March of 1973, Gallo Tapado and Chicano Power fought "Kanek" (spelled like that) and TNT in the main event, while As Charro and Tony Salazar faced El Lince and El Cóndor in the semi main-event. In Mexico City, Canek started training with the Mexican-Korean former wrestler Felipe Ham Lee, Sugi Sito, and the original Fantasma de la Quebrada, at the Ham Lee Gym. Some time later, Ham Lee got René Guajardo to book Canek for a few tours around Northern Mexico, but in the first match Canek had a bad day and he was so terrible that Guajardo sent him back to Mexico City. However, some time later, Guajardo was in the capital and saw Canek again, but this time Canek put on a hell of a match so René invited The Mayan Prince to wrestle for his promotion during a whole year. There, Canek won the Northern Mexico Heavyweight Title defeating Jose Torres, the masks of El Destroyer (Marco Tulio, Antifaz's dad), Lemus, and the hair of Sunny War Cloud, Ruben Juarez, and the same Jose Torres. In 1975, Francisco Flores decided to try to finish with EMLL's monopoly of the lucha libre business in Mexico and create a big independent promotion. The 29th of January, the UWA (Universal Wrestling Association) was born, and it had a debut card full of stars, a show in which Canek wrestled too, teaming with Dory Dixon and Sunny War Cloud to lose against the dream team of Mil Mascaras, Ray Mendoza and El Solitario. In this new promotion, Canek wrestled as a rudo. Canek started to rise to real stardom after he won the National Light Heavyweight Title defeating "El Galeno Del Mal" Dr. Wagner (Sr.) the 15th of January of 1978 in Mexico City. He'd lose that title a few months later (June 20, 78) against Dos Caras in Pachuca, Hgo. This was the start of one of Mexico's most important rivalries ever. With Mil Mascaras out of the country most of the time cashing the big paychecks from Japanese and American promoters, and Guajardo and Mendoza getting older, the UWA needed a new generation of leaders, and Canek and Dos Caras were perfect for those positions. As Dos Caras would join his brother Mascaras on his Japan tours most of the time, Canek became "the chosen one". The 27th of September of 1978, Canek defeated Lou Thesz to get his first ever UWA World Heavyweight Title reign. By defeating Thesz, Canek gained international exposure. Around the same time, the UWA got a talent trading deal with the New Japan Pro Wrestling office. Japanese superstars like Antonio Inoki or Riki Choshu would come to Mexico to wrestle against Canek, and also, Canek would travel to Japan to face superstars like Tiger Mask or Tatsumi Fujinami. Canek's big matches against the foreign superstars at the UWA headquarters of El Toreo de Naucalpan drew huge gates to the point that this formula kept being used for more than a decade. New Japan would send a couple of their big stars at a time, those would usually trade the UWA title with Canek just to lose it in the big re-match a couple of months later. In October of 1983, Canek vacated the UWA title and decided to try wrestling in the US. He had already wrestled in the States, as he participated in the '81 and '82 editions of the New Japan hosted MSG Tag Leagues (first teaming with Super Maquina, then with Perro Aguayo) and the '70 edition of the MSG singles tournament, but this time he went to wrestle in Texas. After three weeks he decided he preferred to wrestle in Mexico, though in the future he had several other small So-Cal and Northern Texas tours, and in the late 80s he wrestled many times at Los Angeles' Olympic Auditorium. During the 80s he basically main evented the UWA cards against every foreign big name available. Some of his most memorable matches were the one in which he defended his UWA title bodyslamming and defeating Andre the Giant in two straight falls (Feb 12, 84), his 3rd fall draw against Hulk Hogan (Sept 2, 84), and his title defense against "The Lariat" Stan Hansen (Sept 30, 84) which he won via DQ. Of course Canek would also defend and trade his UWA title with national talent, in fact, from mid-83 to late-89 the UWA wouldn't have a foreign heavyweight champ (though Killer had a foreign rudo gimmick). Some of the national workers Canek wrestled against were Perro Aguayo, Scorpio, Enrique Vera, Villano III and Dos Caras. But "los independientes" (name that the UWA and its wrestlers received) had so many important wrestlers that many times they booked big tag team main events, like the 16th of Jan, 82 when Perro Aguayo and Canek drew against Tamba and Andre The Giant, or the time (around Jul-Aug, 82) the weird team of Hulk Hogan and Gran Hamada defeated Aguayo and Canek. The UWA kept using the Canek vs. foreign challengers formula to death using other talent like Pat Patterson, Big Van Vader, Vampiro, Buffalo Allen (Bad News Brown), P. N. News, Konnan, Ricky Santana, Miguelito Perez, King Haku (Meng), Bam Bam Bigelow and Kokina (Yokozuna). However from 1992 to 1994, with the rising popularity of AAA, the UWA kept slowly dying until it finally closed its doors with Canek being the final UWA World Heavyweight title holder. In 1992, Canek had some Japanese tours performing in the Wrestle Dream Factory and W*ING promotions. While competing at this last promotion he had a singles match against Mil Mascaras. Also in 1993 Canek started wrestling for EMLL and on 03/26/93 he gained the CMLL Tag Team titles teaming with Dr. Wagner Jr. and defeating the team of Vampiro & Pierroth Jr. in a best of 3 match series that was the finals of a tournament for the vacant titles. That title was vacated on November of 1994 as Canek stopped wrestling for "La Empresa" due to an elbow injury. Canek wrestled for AAA in a limited capacity where he smartly was used for big angles and important matches where he still defended his UWA belt, which he temporary lost from August 15, 1999 to September 6 against Cadaver De Ultratumba. Even though always a very solid quality wrestler, he never was an off-the-charts performer like Dos Caras or Solitario. However his incredible amounts of charisma, popularity, box office power, and the fact that his mask is one of the most beautiful and meaningful hoods ever seen, made him the Mexican idol and lucha libre legend he is now. Canek returned to CMLL on April 30, 2004, immediately feuding with Dr. Wagner Jr.. When the Doc switched to the tecnico size, Canek mirrored him and switched to being a rudo. As part of the build up to an mask match between the two, Canek lost the UWA World Heavyweight Championship to Wagner. Events have stalled from there. The mask match date never got set, and was seemingly forgotten for the time being. Wagner's tecnico turn (and Atlantis' rudo turn) lead the Doctor to other feuds. Canek was left without a big rivalry and his trademark championship. 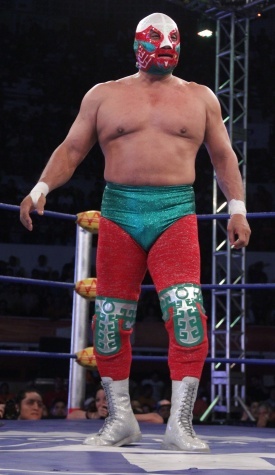 To fill the void, Canek feuded with other aging heavyweights, like Rayo de Jalisco Jr. and Head Hunter I, and also won the IWRG Intercontinental Heavyweight Championship. When Canek returned to CMLL, there was talk that the promotion only took him back, and gave a part time spot to one of his sons (Canek Jr.), on the promise that Canek would lose his mask in their ring. That hasn't happened yet. Canek's a ponderous wrestling at this point of his career, but the fans still see him as a living legend. His signature power moves still get over to those who've seen him and know him. early mask design at age 21. Revista LUCHA LIBRE 1973. At age 21 w. early mask design, Revista LUCHA LIBRE 1973. (1) Relevos Suicidas vs. Ultimo Vampiro & El Mexicano; (2) 4 way match with Wagner Jr. & Rayo Jr. This page was last edited on 14 February 2019, at 23:47.